Jet lag can be a major problem when traveling abroad whether you’re going on holiday or for work. It takes your body one day per time zone to adjust. Putting that in perspective, if you’re going on holiday to California for a week, you’ll still be suffering from jet lag by the time you leave. Jet lag, or dysrhythmia, occurs after east-west air travel when your body clock isn’t synchronised with your new time zone. It can disrupt more than 50 physiological and psychological rhythms. Unfortunately it also gets worse with age particularly after age 50. Unaided, it takes your body one day per time zone to readjust. It may take 2 to 3 weeks to completely realign your rhythms. Until recently, jet lag was dismissed as merely an unpleasant side effect of air travel. New research suggests that it may also cause memory loss, shrinkage of parts of the brain and negative side effects on blood pressure. The good news is: it can now be virtually eliminated. Clinical research conducted at NASA and elsewhere demonstrates that with a properly timed exposure to bright light in specific wavelengths, and a similarly timed avoidance of light, it is possible to safely and efficiently shift our body clock up to 6 time zones in 1 day, and up to 12 time zones in 2 days. With proper use of light therapy your energy, mood, concentration, performance and sleep patterns can all be reset to your new time zone in as little as 60 minutes. What is special about the light therapy in preventing jet-lag? Traditionally, light therapy meant sitting in front of a large light-box (about the size of a regular mirror) and looking directly into it for an hour. While effective, it was awkward, boring and time consuming. Thankfully, the light therapy glasses are revolutionising light therapy and making it quick and incredibly easy. The glasses size and built-in rechargeable battery means it can be used anywhere; on a train, aero plane, or simply at your desk or table at home or work. You are free to get on with other things such as eating breakfast or reading a newspaper. It has never been so easy to get the light you need into your routine. 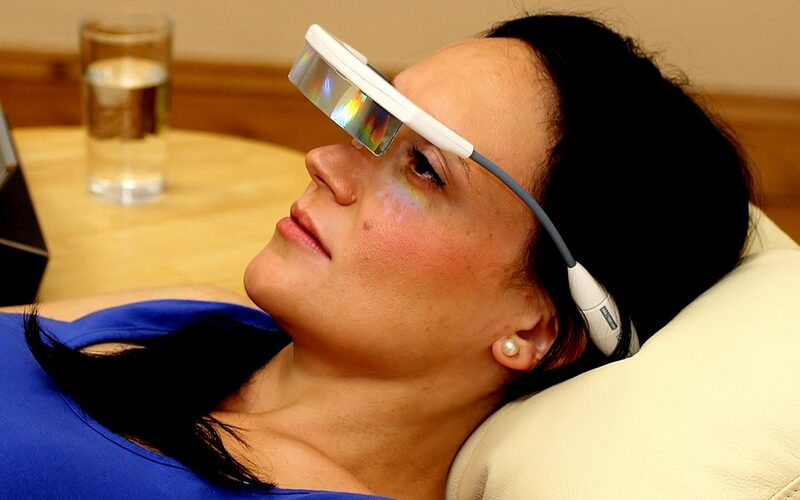 How to use light therapy glasses in preventing jet-lag? TYPICAL EXPOSURE TIME: Day of travel – 30 to 60 minutes. Second day – 15 to 30 minutes. LIGHT AVOIDANCE: Avoid bright light (sunlight) at specific times. This is just AS IMPORTANT as seeking bright light at specific times. If you receive exposure to bright light at the wrong time, you WILL make your jet lag worse – your body clock could end up Tokyo time instead of Paris time! It is not critical to avoid interior light, such as in a hotel room, office, or restaurant, although many frequent travellers report best results when they avoid any source of light during specified times.